Always been a free spirit, Chris-Tian RA discovered on his journey, that the greatest freedom possible comes from being Soul-Aware. His teachings are rooted in his own experiences and are not bound to any religion, a particular spiritual movement or any other believe system. At the age of eighteen he had a unexpected Out-Of-Body experience that lasted for two hours. Bathed in the purest Light and unconditional Love this event set the direction for his future Life. His vocation emerged shortly after the birth of his second daughter in 1985 in Munich/Germany. His crown chacra opened during his first Meditation ever in this lifetime and a Spirit Teacher announced his presence to him. After a year of intense training on how to work with this spiritual being he began to offer his services as Channel-Medium and Energy-Healer. Until 1998 he had worked with thousands of people throughout Europe, supporting them on their Life’s Journey. MURAM, the name of his Spirit Guide, is until today the main ‘source’ in his One to One work with people. Following an intense inner Call in 1998 to live in New Zealand it did not take long that his First Eye, the energy centre in the middle of the forehead, began to open, the beginning of his connection with the soul teachers THE MASTERS OF THE PYRAMIDS. Slowly Chris-Tian RA became able to receive the first clear messages from these highly evolved beings. With support of his ex-wife and friend Nina he channeled vast amounts of messages and created the first book with the teachings of the MASTERS ‘Awaken to Your True Self‘. Practicing the meditations and teachings from the MASTERS enabled him to experience for the first time in this life complete awareness of the Soul. He realized that passing on these teachings to others was a big part of his vocation and he gave uncountable Talks, Workshops and Study Groups throughout New Zealand. Guiding fellow brothers and sisters towards Soul-Awareness became another priority in his vocation. In 2003 his body became very ill and in a coma-like state new messages and images from the MASTERS started to stream in. They showed him the impact of a Dark Energy on the planet and he could see to what extent Light and Awareness was diminished by that Force. After a quick recovery he began a new Cycle of channeled readings with the MASTERS and created the second book ‘The Transformation of Dark Force and the Awakening of Humankind’. At the same time he incorporated the new messages and meditations into his Workshops. 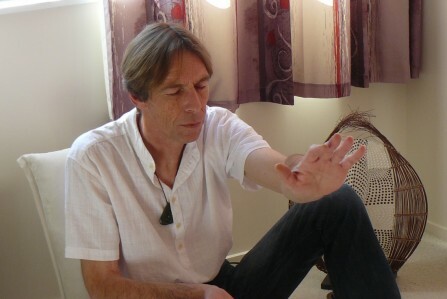 At present Chris-Tian RA is based and works in Wellington/NZ as well as giving Channeled Readings and Remote Spiral Healing sessions to people from around the world. Frequently he also travels to Japan and Australia, giving Talks, Workshops and One to One Sessions. If you are interested in Chris-Tian RA coming to your part of the world, don't hesitate to just contact him.